I believe these are foundational beams of something that used to stick out into the water. Or they the base of trees that once stood here. 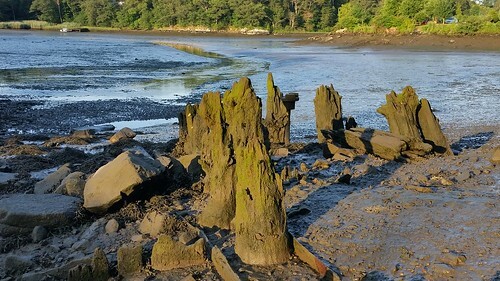 I loved looking at these pillars whenever I walk by this place during low tide. There are sometimes ducks out among them but not today. Still, their mixtures of green, browns, and grays makes it feel like that have slowly evolved into the surrounding world. I can't quite tell if they are trees or foundational poles. There seems to be indications they could be either given their shapes and some of the metal work on the ground. Every time the tide goes out, it's like there is this alien landscape to explore that only exists for a few short hours.